How Safe Is It To Live in a Home With Bats Living in the Walls? Health department officials say it’s never safe to co-exist in a building with bats. The biggest problem with bats in any living structure is always the threat of rabies. It is very hard to even know if you were ever even bit by a bat because of the size of their teeth and the tiny bit mark it leaves behind. If you slept in a room where a live bat was found, please contact your local health department for guidance and possible treatment to exposure to bat rabies. The same advice is recommended if a bat was found in a room occupied by a young person, elderly or incapacitated individual. This is NO JOKE and not a scare tactic! Your safest bet is to go see a doctor. The bite marks are so small you may miss it but don’t let the bite size fool you! The teeth are so small, the bite of a bat might not even wake you up! A bat tested positive for rabies in Lufkin TX in 2013. A bat colony in a Lufkin TX home forces residence to move into a motel August 2013. Bat guano accumulations in the walls of a Center TX business prompt action when restaurant patrons complain about strange odors. 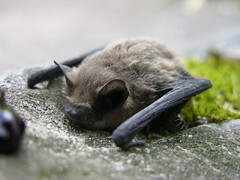 A bat found in the Texarkana area in September 2012 was found by the CDC to be infected with Rabies and West Nile! A link to the KTBS article about bat rabies at the bottom of this page. A bat found in Lufkin TX in Jun 2013 was found to have rabies. Arkansas had discovered 11 rabid bats in the first 6 months of 2013. the treat is REAL. Sometimes people learn they have bats in their home when they see one flying out of their house and they discovered bats exiting from the eaves. A common statement from our customers is “One bat after another came out”. They may give up counting at 200 bats as more bats continue to fly out. “They say bats are like mice, if you see one there are probably many more”. A home in Vicksburg MS was found to have over 1400 bats living in it in early 2013! While bats may look very large while they are in flight, they are actually very small, about the size of a mouse or even smaller in some cases. They can get into very small cracks and hundreds of bats can occupy a relatively small space if they feel safe, the temperature and humidity is acceptable and has the right texture to enable them to move around. This is why the back side of a brick wall is one of the most common locations of a colony of bats. Brick walls are about as perfect a bat house as it can be! The bricks hold heat, there is some ventilation, usually plenty of access points to get behind the wall and lots of grip on the bricks and mortar joints. How can I get rid of bats in my house? We know how to get the bats out of your home and keep them out. We promise you that in a written guarantee. We use the latest and most humane methods of bat removal and bat exclusion to seal up all potential bat entry and bat exits points in your home. No matter the condition of the home, it can be sealed to prevent bats from entering! Almost every home ever built has at least one point which a bat can enter. Bat proofing a house is a specialty; not something you are going to get in a turn-key custom home. Builders just do not go that extra mile to ensure a home is tight enough to prevent bat entry. It is a time-consuming process and if not done correctly, will fail. After we remove all the bats, we seal up your home, remove bat guano and deodorize the affected areas. Please call and inquire about our bat inspection, bat exclusion and bat control services. Don’t be fooled by false claims of dog repellent, cat repellent, strobe lights, yellow bulbs, lights on timers, strobe light on timer, loud music, electronic ultrasonic sound emitters, bat repellents and moth balls! They do not get rid of bats; it just makes your house stink and unsafe and waste your money! Concerned about bats & rabies? We do not trap bats unless requested to do so for disease sampling. We do not relocate bats because it is a waste of our time and your money. Not only will they likely return, it is illegal in most cases! The bats are evicted from your house and not allowed to return. After a few days of realizing that they can not enter their old roost, they will move on and give up trying. Call (318)553-3006 to end your bat problem today! Do you have a bat in your home or bats in the attic and want it gone now? Need to know what to do with a bat in the house? We are available with our emergency response trailer ready to remove any bats from the living space of your home. We will also do a thorough inspection of your home and attic and determine if it’s a stray bat from outside or if you have bats in the attic. Kick them out of your house and into a bat house of their very own. It is a Win-Win situation for you and the bats. You get to keep the benefits of the bats which is that they eat a lot of mosquitoes. How is bat guano cleaned up? Bat Guano removal can be a long, hot and tedious job which is best performed by properly suited professionals wearing Personal Protective Equipment. The hazards associated with exposure to bat guano far outweigh you trying to do it yourself. Diseases such as histoplasmosis and eco-parasitical insects like bat bugs are part of the problem but our customers most often complain of the smell associated with bat guano. Imagine living inside a chicken coop on a hot August day. That’s how bad your lovely home can smell if bats are left to rule the roost. We have an Emergency Response Trailer specifically outfitted for Advanced Bat Control. Visit our other websites for more information regarding bat control, bat removal, bat eradication, bat extermination, getting bats out of the house and the dangers or hazards of finding a bat or bats in your home or bedroom at night. Also read about bat guano, bat poo, bat poop, bat feces and bat urine odors, smells, foul or strange odors and the cleanup or clean up procedures involved in getting the bat crap out of your attic or walls. Also the methods and techniques used to make the living area safe for human habitation. Do not live with bats in your house! The dangers are serious and real. Your health is not worth the risk!